During the Paleogene and Neogene, a great many new mammal species evolved. As in previous periods, vacant ecological niches played an important role. Some animals returned to life in the sea, spread over the Earth as the continents changed locations. The first mammals evolved around the same time as the dinosaurs. They had thus existed for many millions of years before the mass extinction that eliminated all dinosaurs. Most early mammals were small nocturnal animals that lived in the shadow of the dinosaurs. But when nearly all large land-dwelling animals died out at the end of the Cretaceous Period, their vacant niches became available to the mammals. They could exploit the resources that the dinosaurs had lived on. The result was a massive increase of new mammal groups. 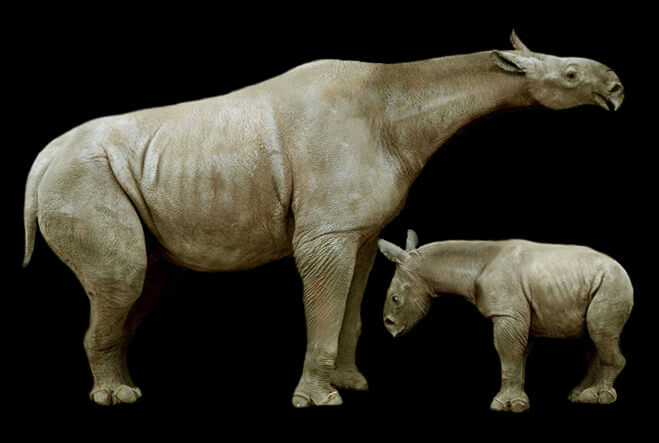 Paraceratherium, a rhinoceros without a horn, is an example of the new large mammals that evolved during the Paleogene and Neogene. This is the largest land-dwelling mammal that has ever lived, and it could weigh up to 20 tonnes – more than three times more than an African elephant! Whales live their entire lives in water, but they evolved from land-dwelling plant-eaters. 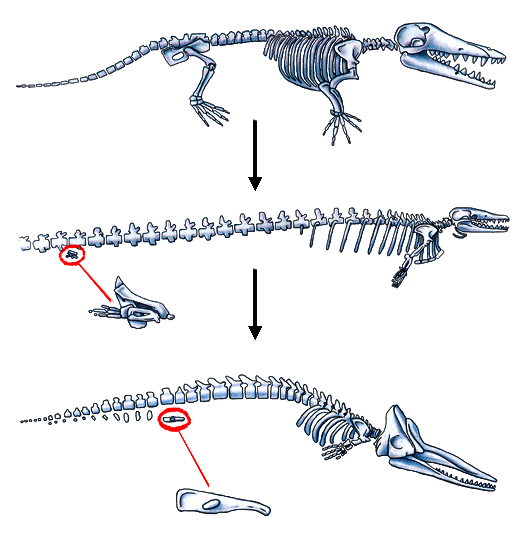 That evolution is one of many examples of how land-dwelling vertebrates adapted to life in the water. Ichthyosaurs, plesiosaurs and mosasaurs underwent similar transformations during the Triassic and Cretaceous periods. Now, during the Paleogene and Neogene, it was the whales’ turn. The stepwise evolution of whales. Almost only the pelvic bones remains on modern whales. They must be able to move efficiently in the water, so the whales evolved a tailfin to swim with. Their rear legs almost disappeared while their front legs evolved into fins for steering. Whales also developed a new way to orient themselves, with echolocation. The way they gave birth and nursed their young also changed. Whale calves are born head last so that they do not drown in the process. Also, whale calves do not suckle. The female’s mammary glands squirt milk of thick consistency – like toothpaste! – into the calf’s open mouth, so as not to thin out in the seawater. Camels are a widely distributed animal group. They first appeared in North America during the Paleogene Period. They spread around the world during the Neogene, first to Asia, Europe and Africa via the Bering Strait. Later, after the Isthmus of Panama formed, they spread over it to South America . 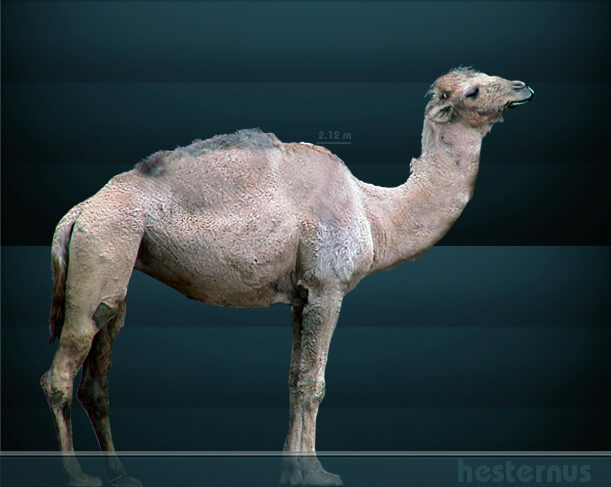 Reconstruction of Camelops, an early camelid that lived in North America during the Paleogene. The original camelids in North America eventually died out. Today, camelid species remain only in Africa and Asia (camels and dromedaries) and in South America (llamas). 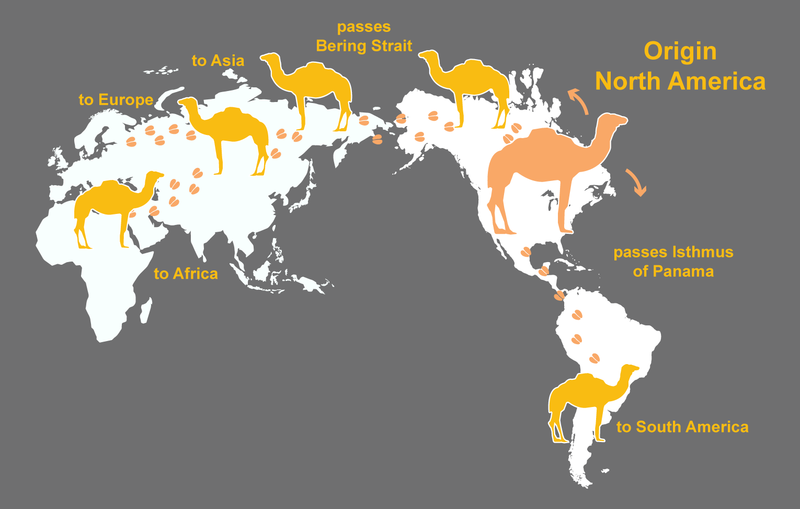 The distribution of camelids today is thus the result of two factors: changes in the shapes and geographic positions of the continents, which made it possible for the animals to spread to new regions, and extinctions which isolated the remaining species from each other. Origin and current distribution of camelids. This was a common evolutionary pattern during the Paleogene and Neogene periods. When the locations of the continents changed, various kinds of organisms were able to spread to new areas. New species could evolve and others died out when confronted with new competitors. The connection between North and South America is a well-known example. When the Isthmus of Panama formed around three million years ago, various animal groups which had been isolated on one of the two continents spread to the other. Horses, camelids and various predators spread from the northern to the southern continent, for example. Fewer species spread in the other direction, but armadillos and opossums are a couple of examples.